This is a good time to be in Mexico, because this is Mexico’s moment. I welcome the fact that with an investment of $3.5 billion USD over the next three years, BBVA Bancomer will strengthen its operations in our country. 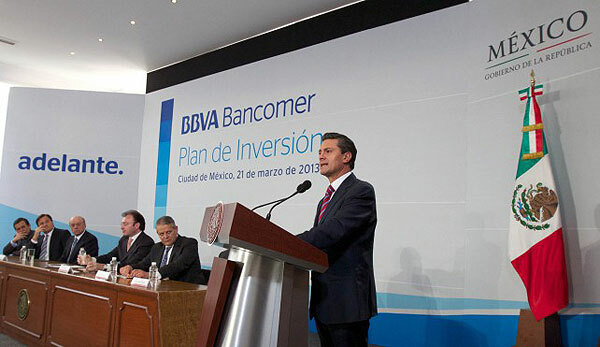 At the official residence of Los Pinos, Banco Bilbao Vizcaya Argentaria, BBVA Bancomer, presented its investment plan confirming that Mexico is crucial to its global growth strategy. Mexico has total macroeconomic stability. Thanks to the strength of Mexican banking, our country has not suffered financial imbalances. However, the challenge is to be a decisive factor of economic growth that will allow us to achieve the prosperous Mexico we have planned. That is why the government is determined to promote financial reform and to democratize productivity, in other words, for all Mexicans, regardless of the region where they live or the economic activity in which they engage, to have the technology and knowledge to be more efficient, add value to their business and earn more. We are determined to modernize our economy and trigger high, sustained economic growth, as the basis for improving Mexicans’ quality of life.